Digital Revolution is an unreasonably entertaining exhibition. Within the Curve Gallery at the Barbican centre they've crammed a crazy amount of eye-catching, imaginative and straight up fun technological trinkets. By the time you've come to the end of the exhibition you'll have had steam billowing from your eye-sockets, been transformed into a birdcreature and flown away and been sung at by the giant creepy Egyptian-styled head of will.i.am. But first a game of Pong. At first it's like you've walked into a particularly busy branch of Virgin Megastore circa 1995. Bathed in futuristic blue light, monitors glow from steel racks and the air is filled with iconic synthesised videogame blips. Somewhere Sonic the Hedgehog has dropped his rings, Mario has gobbled a mushroom and the Russian folk song Korobeiniki (immortalised in gorgeous DMG-CPU-03 GameBoy synth) floats across the room. It's as if ten-year-old-me has died and gone to heaven. Projectors around the room show some of the greatest hits of 90s tech; the T-Rex from Jurassic Park, Lara Croft diving through flooded tombs - even beloved obscurities like Parappa the Rapper get their moment in the sun. Someone enjoying Super Mario Bros. It's peculiarly touching to see all these childhood favourites immortalised in a gallery - what was once regarded to be trivialities now behind plexiglass with a little description alongside explaining its heritage and cultural import. As we move through the exhibition we quickly realise that these 8, 16 and 32 bit classics represent the testy first dabbles of culture's toes in the digital sea - the early years when it began to realise the joy of shifting pixels. The rest of the exhibition is devoted to the potential of technology to elevate mankind, appreciate the world in new ways and explore our rapidly growing technological legacy. It's this last aspect that this exhibition really opened my eyes to. By its very nature the internet is transitory - a website changes its design and (aside from archived screenshots) it vanishes forever. As long-forgotten servers die, so to do the dusty bytes hidden away on them. Experiencing these early webpages feels somehow important to understanding the modern internet. I was particularly impressed by Hi-ReS! 's website for Requiem for a Dream which uses Flash 4 magnificently in recreating the style of the film as a page. You can experience the archive of this here - a vintage yet still lovely slice of internet art. The most impressive example of trawling through the lost internet is Richard Vijgen's The Deleted City. If you were online in the mid to late 90s you weren't anybody unless you had a GeoCities page crammed full of flaming skull gifs and "Under Construction" banners. As the internet evolved and social media began to grow, people quickly abandoned the site, first to MySpace and then Facebook, leaving behind an internet ghost town. In 2009 the death sentence was pronounced; the entire community was to be deleted. In a heroic effort, a team scoured the servers of data before deletion - amassing a 650 gigabyte file. In The Deleted City you can explore this archive, navigating through the cyberboulevards and zooming in to see what you can find. I unearthed an enormous cache of bitty, low-res pictures of Sporty Spice and a bizarrely comprehensive history of the haircuts of The Backstreet Boys. Vilgen describes his work as a "digital Pompeii", and much as we stare at ancient Roman graffiti and try to put ourselves in their sandals, perhaps future generations will ponder Bonzi Buddy and try to deduce why we despised him so. As we move further through, there's a whole raft of exhibits that allow you to see yourself reflected back in the cold panel of a TV screen with effects applied. This stuff, novel and entertaining back in 2003 with launch of Sony's EyeToy is looking a little bit creaky in 2014 - though at least what's on display is visually compelling. The technology powering most of these appears to be Microsoft's Kinect, which makes up for its shortcomings as a game controller by working beautifully as an art delivery device. The undisputed highlight of this section (and maybe the whole exhibition) is Chris Milk's astonishing The Treachery of Sanctuary. 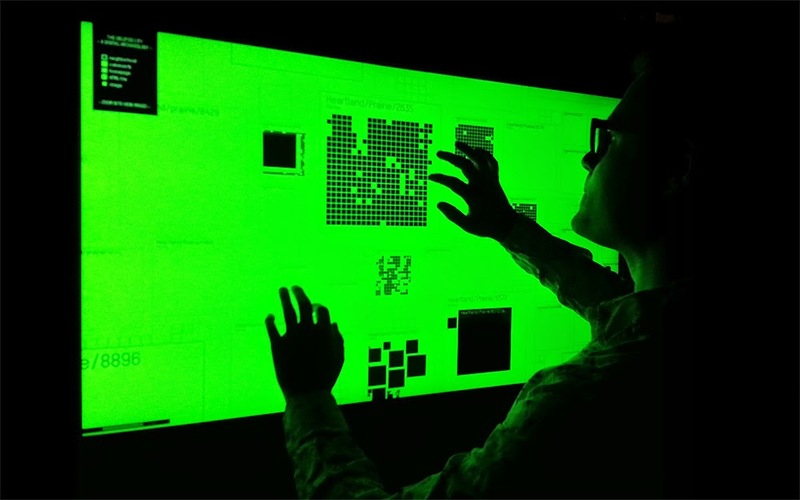 In this the viewer stands in front of a series of white screens to see their silhouette. Above the screens a flock of birds spirals and loops around. In front of the first screen you see your body slowly dissolving into more birds. The second sees birds swooping down and snatching pieces of you away. The third, and most impressive, sees the subject raise their arms to find that they've been replaced by graceful feathers. As you move your arms you hear the sound of wind swooshing through them - flap your arms and you take off, flying through the air. Just watching it is fun, actually doing it is amazing. This piece isn't breaking any new technological ground but it's a great example of an artist precisely understanding the limits of the devices they're using. This underlies much of what's on display here; it's less about marvelling at the gadgetry and more at the imagination of those using them. Perhaps the pinnacle of this comes with Dreamin' About the Future, a multimedia installation by will.i.am and Sean 'bare' Rodela. Working on the principles of the 'hollow face illusion', will.i.am's polygonal face tracks you across the room. In an exhibition full of illusions that rely on mountains of mathematics and circuit boards, this one works a straightforward optical illusion; albeit one augmented with a great projection. The gigantic godlike head made me feel oddly like a worshipper of technology, staring up at some gigantic omniscient CGI god whose eyes follow me wherever I go; a subtle criticism of an increasingly interconnected, privacy free world? I've covered but a smidge of the stuff here, but everyone should check this place out - especially if you're the curious sort who likes to fiddle with all kinds of interesting little tech toys. Other than the above be sure to check out the excellent Assemblance by Umbrellium on sublevel -2 where you can dance with light. This whole thing stinks of excellence - it's an almost embarrassingly good time. 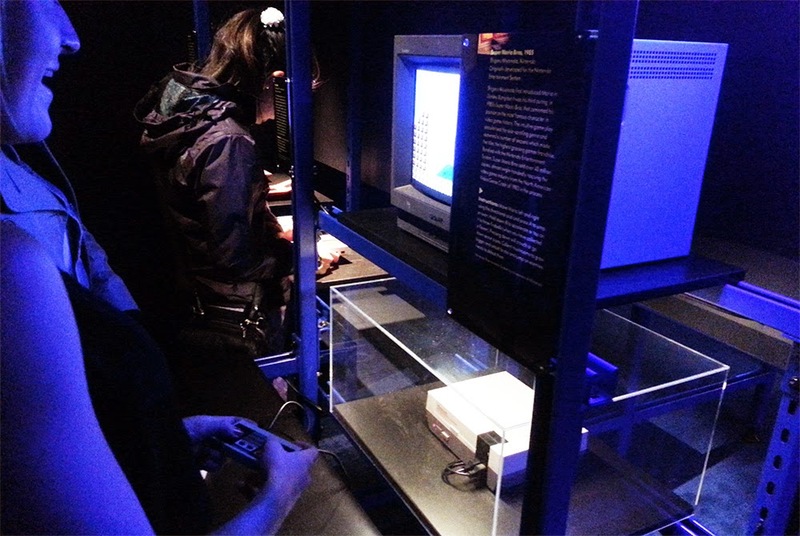 Digital Revolution is at the Barbican Centre until 14 September 2014 - 11-8pm daily. Standard ticket £12.50.